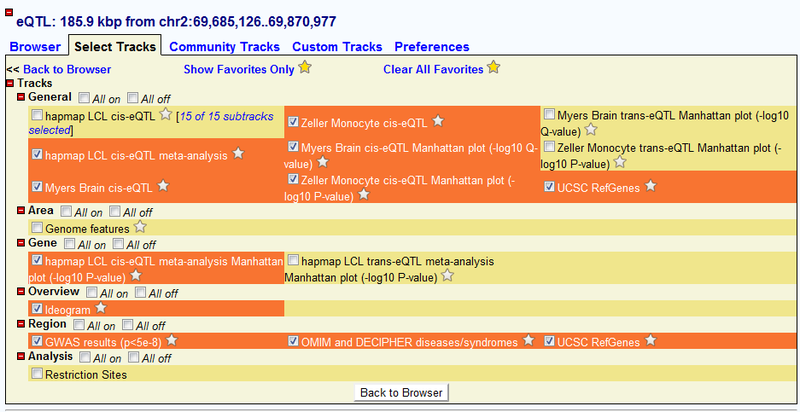 seeQTL is a genomic browser based eQTL database developed under Gbrowse 2.0. The Landmark or Region: genomic coordinate of current genomic window. 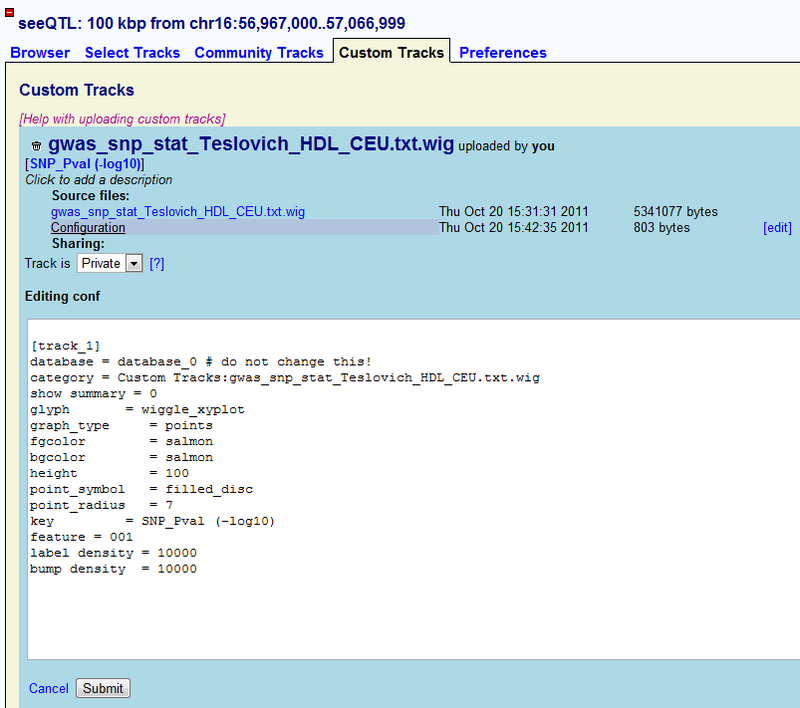 User can also input the search items here by Gene Symbol, dbSNP ID or genomic coordinate. 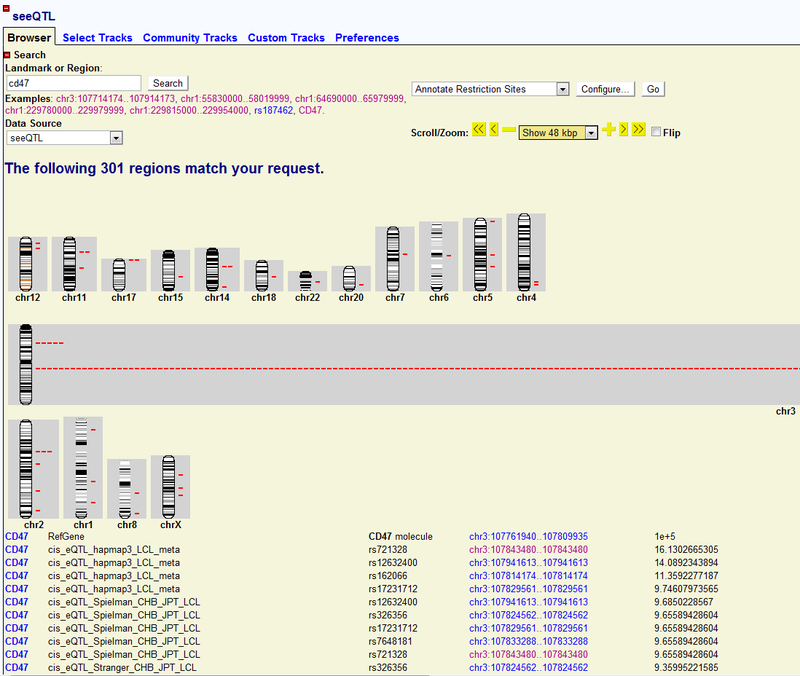 Users will be directed to another page showing whole genome view of CD47 associated SNPs. The detail of each association is also shown below in the tabular form. 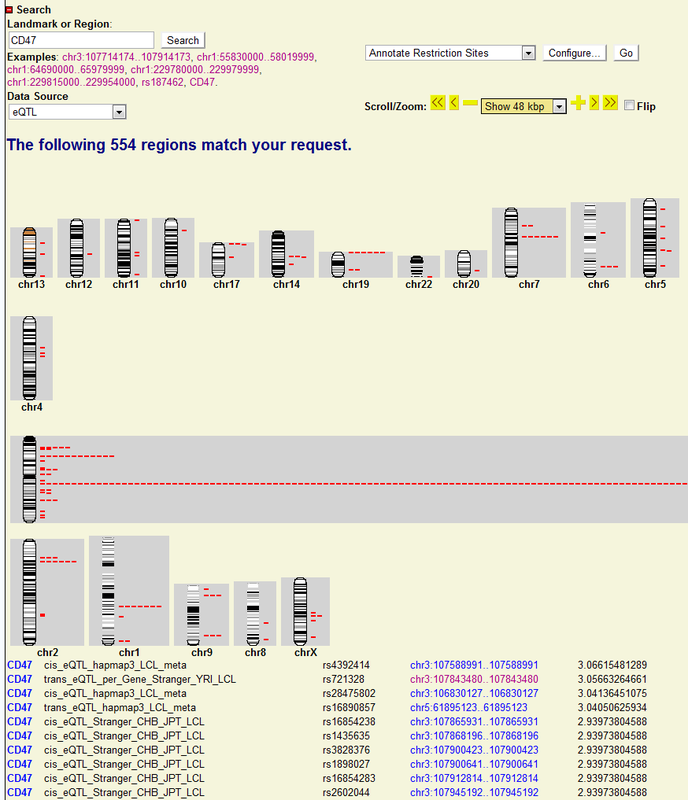 Users can also click each association and will be directed to the new genomic view page for particular SNP. new genomic view page for particular genes. database = database_0 # do not change this! After finishing uploading the track, Gbrowse will generate a default configure file for the track you upload. It defines the track to show as box plot. By clicking the ��edit�� button on the right, users will be able to edit the configuration of their P-value track. If users want to show their SNP P-value as Manhattan plot, we recommend users to use the following configuration (CONF file). 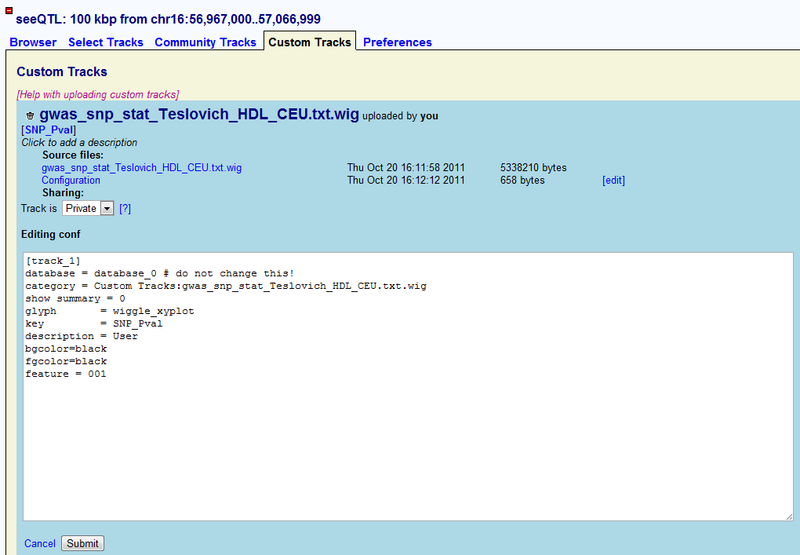 Please keep in mind that the users cannot change ��database = database_0�� because it is where the uploaded tracks locate. After input the proper configuration file, user can submit and go back to the browser. 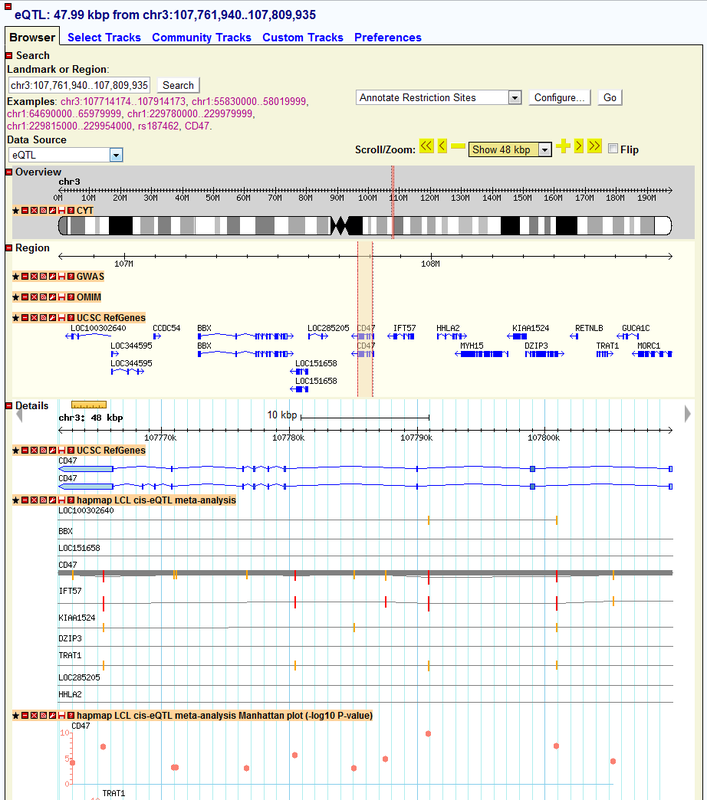 A new track named as SNP_Pval is shown in the browser, where users can easily navigate across the genome. Search the CD47. A whole genomic view of CD47 associated map will be shown. I can easily find out where the CD47 associated SNPs locates across the genome.In this case, chr3 is enriched with a lot of associated SNPs. Since CD47 is also in chr3, the enrichment of associated SNPs just shows strong cis-associations of CD47 with adjacent SNPs (cis-eQTL or local-eQTL). Below the genomic view, I can also find the top associated list of SNPs together with their location and link. Each link will direct me to the genomic location it points to. 2) Then I want to see how the local eQTL affect the gene expression of CD47 gene location, I just click the location link of CD47 and directed to the genomic location of CD47. In the new window, I found many tracks of eQTLs and I am just interested the meta-analysis results here, I just look at the track named as “hapmap LCL cis-eQTL meta-analysis Manhattan plot”, which shows the Manhattan plot of location association of CD47. 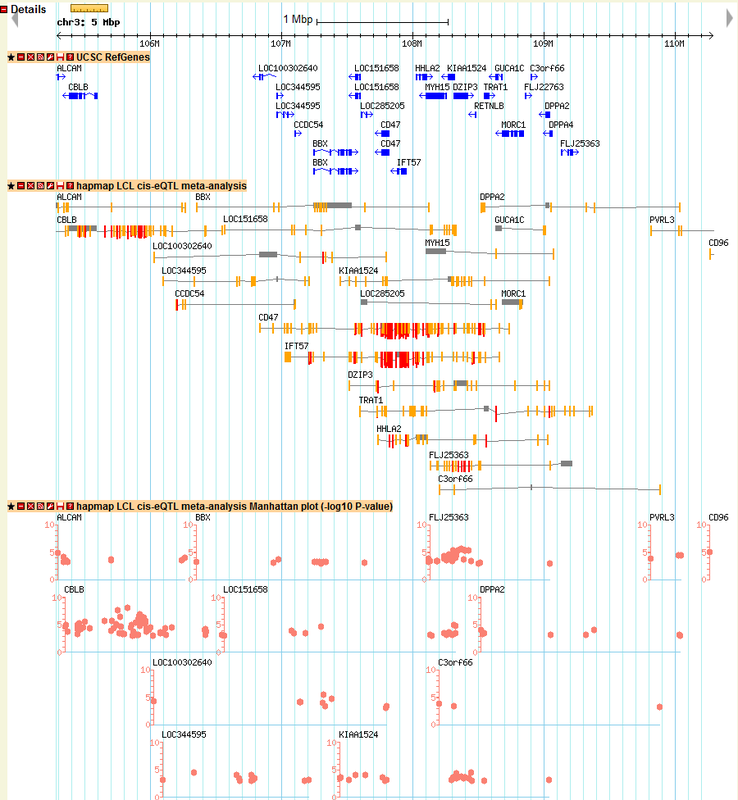 In the pictures below, I didn’t find many strong associated SNPs in the gene body of CD47. The reason is that sometimes the regulatory element is upstream (3′-UTR) or downstream (5′-UTR) of gene body. In order to check other SNPs close to CD47, I just select to zoom-out into a 200 kb windows. 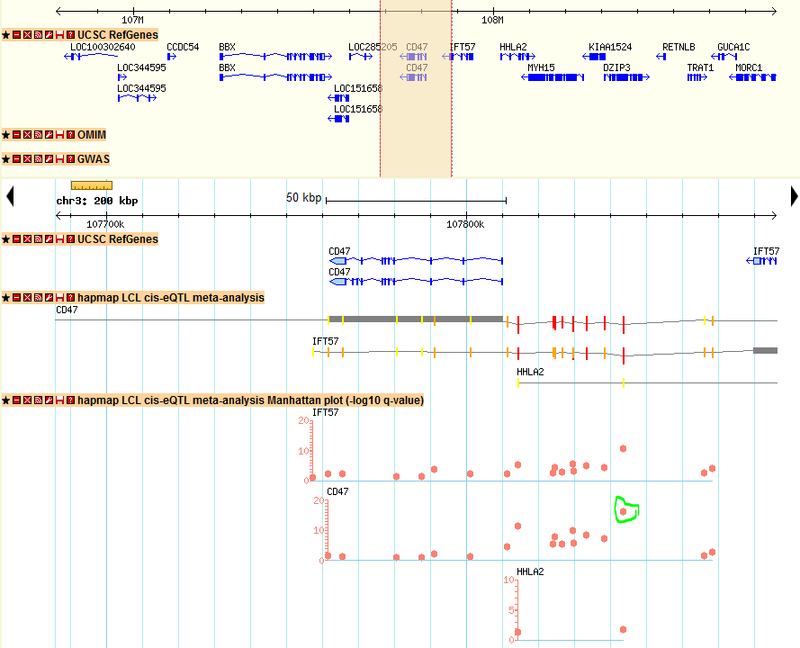 Then I can find a strong associated SNP in the 5′-UTR of CD47 with q-value > 10 (marked in green). That particular SNP could be the SNP regulating the gene expression of CD47. 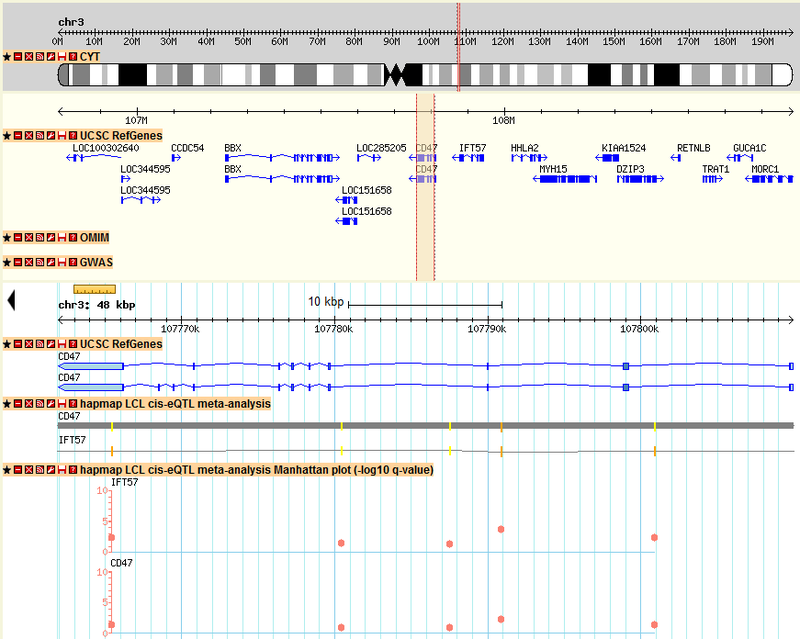 3) In the figure above, I also observed similar pattern of Manhattan plot for IFT57, which is a different gene upstream of CD47, this could be an indication that both genes are correlated and regulated by the same genomic regions. This example is just an illustration on how to explore seeQTL and find scientific interesting results. All the other genes and SNPs can be searched and browsed in the same way.